How does that saying go? Necessity is the mother of invention? Over the years the kids have developed very different likes and dislikes, but they all enjoy yogurt (but go their own way when it comes to which flavors are their favorite). 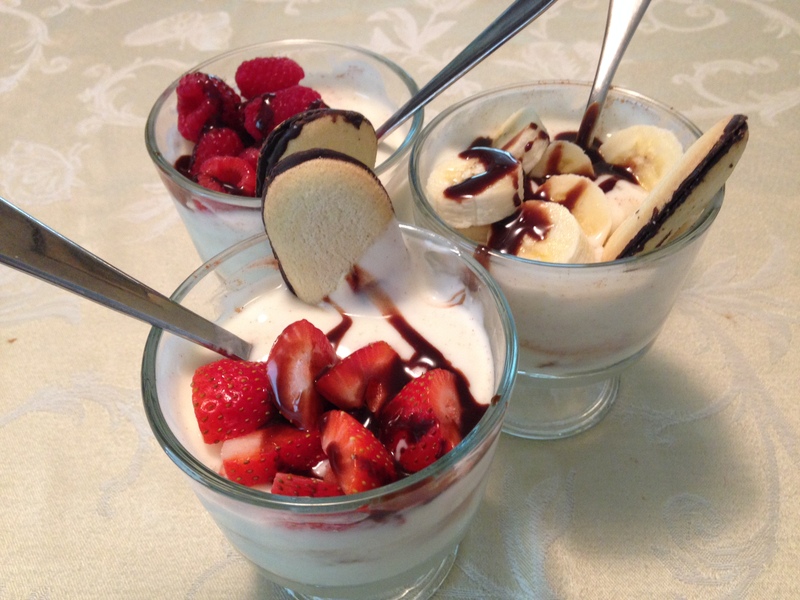 Each week I buy a large organic or Greek yogurt (I follow the sales) in vanilla and use it for customized parfaits. The parfaits can include any elements you have on hand, and can be geared to each children’s taste. You can also clean and cut the fruit and leave out the toppings and let the kids create their own parfait masterpiece! What I did for the photo above, was take vanilla yogurt, mix in cinnamon, then added each kid’s favorite fruit to the top. Then I drizzled on some Hershey syrup and added a Milano cookie. It is a good way to create a healthy dessert and can be made with whatever you have on hand, just think of balancing crunchy and smooth; as well as, sweet and tart.